As you are scraping the frost off your skiff and breaking the ice out of the bottom of the livewells, you wonder what you are doing this morning. It’s cold. Real cold for coastal North Carolina. Usually when you take your skiff out you have to buy ice, now you are hoping it melts. You’re going redfishing in February and you’re probably wearing all the microfleece you own, you also are pretty sure you’re going to catch a pile of fish. To catch reds in the winter around here you have to find them. I know that is what fishing always is, but its compounded in the winter. The fish get together in massive schools. You almost never catch just one fish. It’s nothing or a ton! You will cover lots of water and not see a thing except crystal clear water that does not contain anything but some worms or snails. 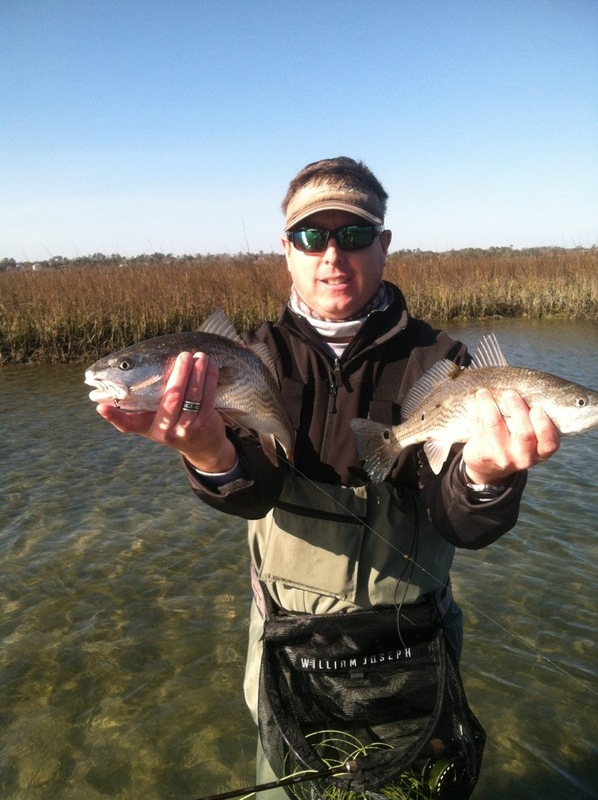 You won’t see mullet jumping and you sure won’t see any redfish. Keep moving. Cover water as fast as you can. Got a trolling motor? Put it on high. Push pole? Good time to get that arm workout. You may not find anything. I know that’s happened to me. Pole all day and find nothing and you will know what being tired and frustrated is all about. Then you see a fish blow out. … Stop. Make a cast into the nearest deep water. Do it again. You may not see anything right away. If you catch a fish, drop the anchor, power pole, stick pin or stake out. That spot where you caught the fish is the spot. Cast in there again. You will most likely catch another. If you have found the spot you will know. Throw a white Clouser and you will swear you have found the magic fly for all time. It’s not uncommon to get multiple bites on one retrieve. The only guarantee I make for you if you try this is that you will see a lot of water if you try it. You may not find any fish at all. It’s like robbing the Bellagio, if you get away with it, you and Rusty and the gang will be rich forever. Otherwise, nothing.